In his message for the World Day of Peace in 2012 Pope Benedict stressed the importance of ‘Educating Young People in Justice and Peace’, encouraging their zeal for the building of a more just and peaceful society. 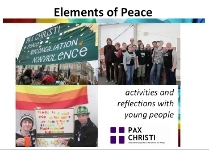 This youth work resource from Pax Christi is a set of activities and reflections each designed to introduce young people to some aspect of the work of Christian peacemaking. The activities, each lasting approximately fifteen minutes, serve as an introduction to many of the key themes which inspire and inform the Christian vocation to work for peace. These activities are perfect as part of a confirmation programme, RE lesson, parish youth project, or group where young people are looking to explore and deepen their faith.